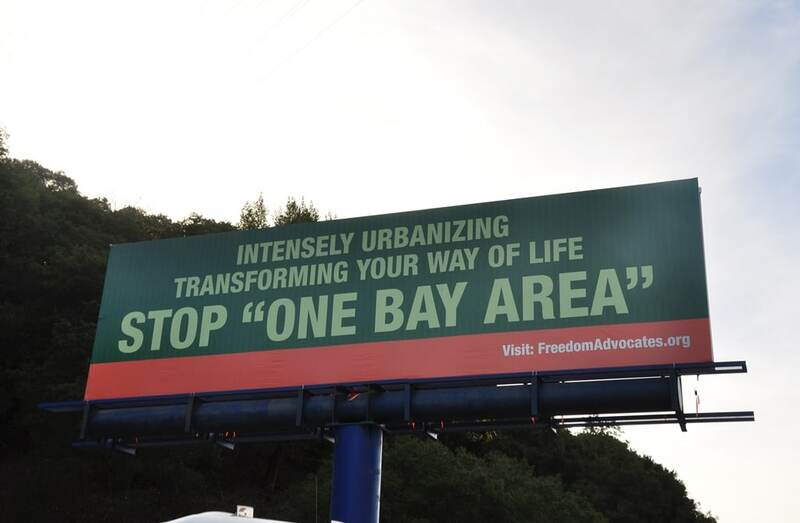 Over the past few years, I and many others in the San Francisco Bay Area have been fighting against a plan that seeks to socially re-engineer our lives: the One Bay Area Plan. Over the next 25 to 30 years it will transform the lives of over 9 million people in 9 counties by creating high density stack-and-pack housing next to mass transit, all in the name of saving the planet by reducing GHGs (Green House Gases). Never mind that global warming has already been debunked by thousands of scientists not on the UN’s payroll. The sky is not falling, but our rights are being systematically eroded. Private property outside of city and county urban limit lines will be highly restricted and/or declared completely off limits as part of the first ever statewide re-wilding and “corridor” system in California is created. The crazy thing is that most people know nothing about all this. Bay Area residents and taxpayers have been intentionally kept out of the process. Most have never heard of the regional unelected bodies pushing these plans or the legislation we are now being asked to follow, yet we all will be affected by it in some way in the near future. Although I will be focusing on the regional plan in the Bay Area, this is happening all over the state and country under different names, so don’t feel left out if you don’t live in the Bay Area. I have done thousands of hours of research over the past few years and have discovered the genesis of these plans and who is behind them. I am hoping that by providing the historical timeline and links to back up my findings, that it will become clear that these plans, although now being pushed by local municipalities and state level mandates, they originated elsewhere. These plans were hatched long before the state legislation was enacted by a small group of NGO’s (Non-Governmental Organizations), stakeholders, foundations and regional unelected bodies funded with tax payer money. 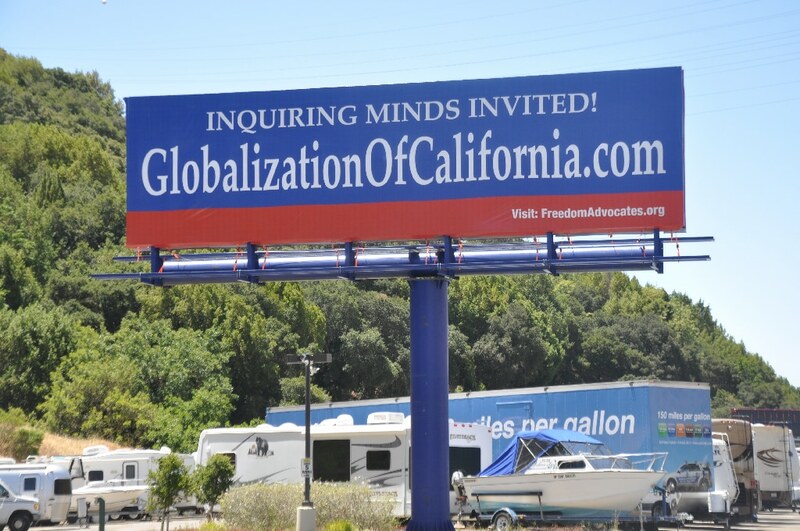 There are three main pieces of legislation that are being used in California to complete the transformation and socially re-engineer our lives; AB321 (2006 Global Warming Act), SB3752 (2008 Sustainable Communities Strategy), and AB27853 (2010 California Essential Habitat Connectivity Map). All of these bills were signed into law by Governor Schwarzenegger. The global warming bill calls for a reduction in GHGs to 1990 levels by 2020. The SB375 bill links land use to transportation and specifies the majority of future construction be compact, high-density, low-income housing next to mass transit, in order to force Californians out of their cars and single family homes to ostensibly reduce GHGs. AB2785 identifies (maps) an animal and vegetation corridor system throughout California, connecting large blocks of government-regulated land through private property that must be taken in some way to complete the California Wildlands corridors. This map3 is most egregious in that it casually illustrates (with a sliding scale of less to more cost) how much it would cost our government (in terms of dollars, conservation easements, eminent domain, zoning to open space, etc) to take the land from private individuals in order to complete this map. California planning organizations are expected to use it in their planning for land use and transportation process. What people don’t realize is that this map is NOT about preserving land (Open Space) for animals, plants, and people’s recreation. These land masses that are being set aside are being incorporated into giant land trusts for the purpose of selling carbon credits in the trillion dollar Cap n’ Trade scheme4 that recently started in this state. A few large land trusts and foundations will be the beneficiaries of this giant piggy bank. Here’s a list of land banks (http://www.dfg.ca.gov/habcon/conplan/mitbank/catalogue/). The CARB board will be giving many of the credits away to preferred corporations and to entice cooperation in the program. This is a fraudulent pay-to-play scheme and giant land grab, not an environmental initiative. 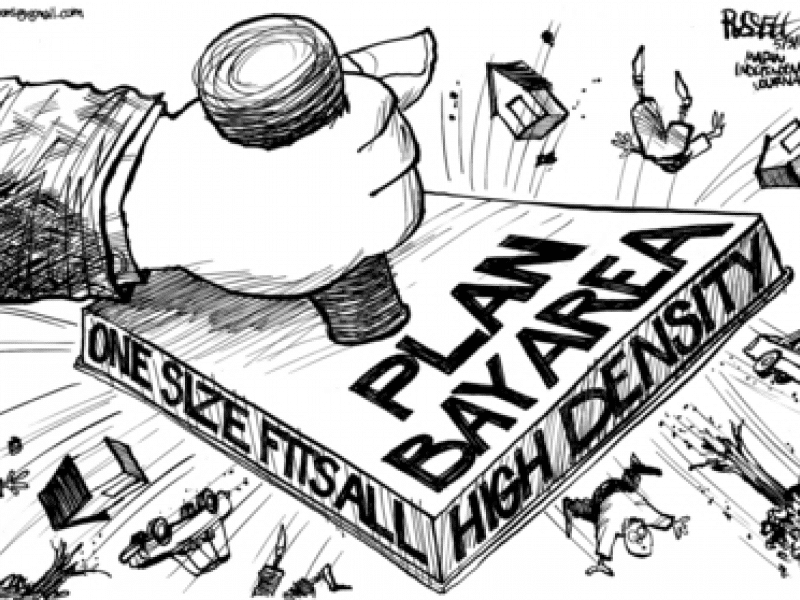 The few regular citizens who have found out about the One Bay Area plan have been horrified at what they discovered as they attended workshops and hearings in an attempt to stop this plan from being adopted. Where did this plan come from? 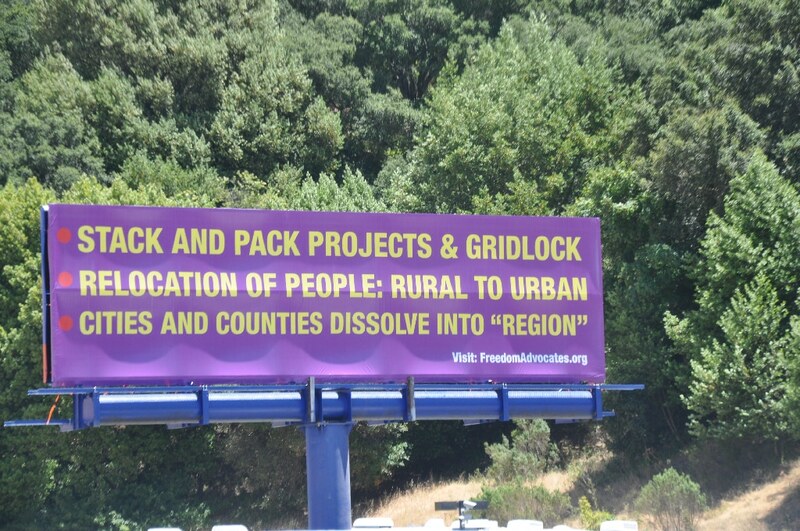 And why are unelected regional agencies dictating how and where the people of the Bay Area will live in the future? Over the years the two main bodies pushing this plan MTC (Metropolitan Transportation Commission) and ABAG (Association of Bay Area Governments) have pointed the blame at either local jurisdictions or at state legislators as the responsible parties. At times they claimed it was an organic, bottom-up plan that the local municipalities want and were asking them to implement. Then on other occasions, they claimed they were only following state-level mandates and that if we had a problem with this plan we should be taking it up with the legislators who voted for the bills. However, the truth is that ABAG and MTC were behind this plan way before the legislation was enacted and have been quietly involved in the forming of this plan for almost 20 years; if you include international connections it is even longer (See U.C. Berkeley PhD. Judith Innes White Paper)5. ABAG led the effort, and along with other agencies they engaged in backroom secret meetings, formed international alliances, as well as regional compacts with stakeholders and NGOs in an effort to reach their goal of transforming our cities and towns into the United Nations vision of Sustainable Communities. This ultimately led to the passage of AB32 (2006), SB375 (2008) and AB2785 (2010): legislation that codified this agenda in California. The following timeline will illustrate how this so-called regional plan came about and who is behind it. You will learn, as I did, that this plan is not a grassroots effort and was not originated at the state level. 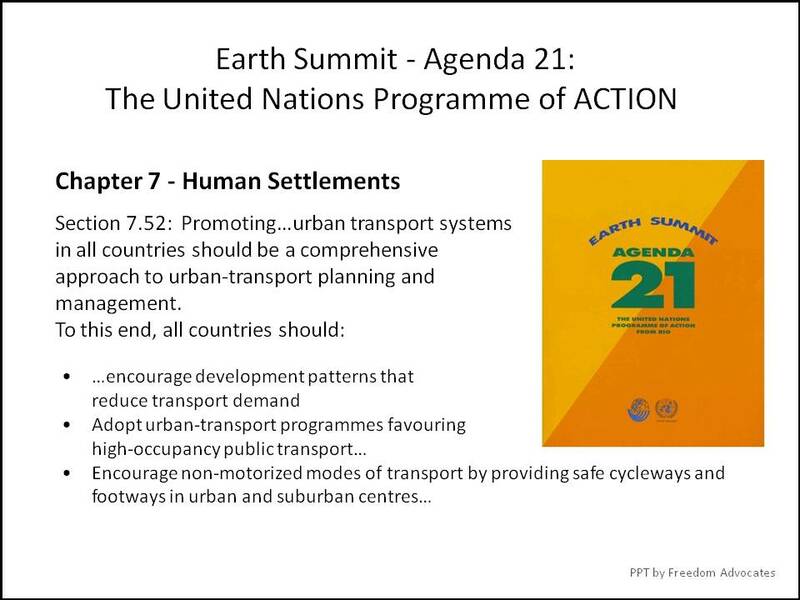 It is an international plan from the United Nations and is referred to globally as Agenda21 Sustainable Development. Again, it is not about the environment; that is a ruse. It is about controlling our society and our lives, curtailing our freedoms, and altering our fundamental Constitutional right to own property. These regional agencies are unconstitutional and the elected officials appointed to them have in my opinion violated Article 1, Section 10 of the U.S. Constitution by joining an international alliance with ICLEI (the International Council for Local Environmental Initiatives) and should be at the very least investigated and/or abolished. I have included links throughout so you can check the facts for yourself. This plan is being duplicated all over the country and all over the world, but the Bay Area is one of the four initial pilot programs within the U.S. The pilot areas were Denver, Atlanta, Chicago and the Bay Area. In my research I found a white paper about the Bay Area Alliance written by Judith Innes a PhD from UC Berkeley (white paper “Getting Serious about the Three E’s”)5. She followed the alliance process from 2004 to 2007 and validates my findings. Although she was seemingly onboard with the planners, she points out how flawed the process was with virtually no experts being used to prepare data and reports and how the stakeholder workshops were misleading and outcomes were controlled and predetermined. 1987 – The term “Sustainable Development” was adopted at the Brundtland Commission meeting in 1987 as part of the “Our Common Future”6 outcome document. The official definition of Sustainable Development is “development that meets the needs of the present without compromising the ability of future generations to meet their own needs.” The term Sustainable Development encompasses three main principles: Equity, Environment and Economy. Economy is the key word used to describe replacing free market principles with PPPs (Public Private Partnerships), as in Communism and Fascism. The Environment is used as a catalyst for change and Equity describes the “social and environmental justice” that is really about the redistribution of wealth. Of course, America is founded on equal rights under the law, and equal opportunity, not equal outcomes. Social equity is the driving factor being used to alter the function of law to impose social requirements, replacing the individual rights on which our Constitution and free Republic are based. 1990 – The United Nations’ accredited NGO (Non-Governmental Organization) ICLEI (International Council for Local and Environmental Initiatives) was founded in order to establish Agenda 21 campaigns throughout the globe. The ICLEI Charter/Constitution7 defines a “world congress” of mayors and elected officials working together with ICLEI serving as the international agent representing the members of the world congress throughout the globe. ICLEI serves as liaison between local governments and international governments. ICLEI members pay dues and must explicitly adopt the ICLEI Constitution which follows the 16 principles of the Earth Charter8 and a model of global governance9. This international membership by cities and counties violates Article 1, Section 10 of the United States Constitution10 “No State shall enter into any Treaty, Alliance, or Confederation… with a foreign power”. The ICLEI headquarters in North America is in Oakland, Ca. Assemblywoman Nancy Skinner founded ICLEI USA11. ICLEI is responsible for injecting international climate, land use and other policies into local governments. Many cities, counties and regional bodies across the country are contracting with ICLEI. Very likely your own city is a dues-paying member. 1993 – President Clinton signs Executive Order 1285215 creating the President’s Council for Sustainable Development, effectively bypassing Congressional approval of Agenda21. This council was tasked with injecting Sustainable Development and Agenda21 into all levels of our government nationwide. 1996 – Richard Clarke, retired Chairman and CEO of PG&E and Michele Perrault, International V.P. of the Sierra club (both members of the President’s Council for Sustainable Development)17 present the idea of a regional sustainable development initiative to the ABAG general assembly and to other NGO’s and stakeholder groups. – David Early, Urban Ecology publishes the Draft Blueprint for a Sustainable Bay Area— The Final Plan (1999) is the basis for the One Bay Area Plan. 1997 – ABAG and several dozen NGOs around the Bay Area sign a Compact forming the BAASC (Bay Area Alliance for Sustainable Communities) (See Compact for Sustainable Bay Area)18. This document specifically states that MTC and ABAG as well as other groups joined forces to implement a regional plan for a Sustainable Bay Area. The document states “It is founded on the principle of the Three Es of Sustainable Development – prosperous Economy, quality Environment, and social Equity.” It also states “The Bay Area Alliance adopted the definition of sustainable development endorsed by the United Nations’ World Commission on Environment and Development.” And goes on to clearly point out “The Bay Area Alliance also operates within an international context. The Earth Charter Initiative (www.earth-charter.org) is an outgrowth of the 1992 Earth Summit in Rio de Janeiro and has many principles similar to the visions and commitments contained in this Compact.” Sunne McPeak19 represented the Business (Economy) side of the Alliance. Sunne McPeak also served on the ABAG board, Bay Area Council and she oversaw the Department of Transportation (Caltrans), the Department of Housing and Community Development, the California Housing Finance Agency, the Department of Real Estate and many others. She was a key player in pushing the SB375 legislation behind the One Bay Area plan. – “Final Blueprint for a Sustainable Bay Area” is prepared by David Early of Urban Ecology (one of the original stakeholders in the Alliance). David Early also founded DCE Planning, which currently consults with local cities and counties to ensure the implementation of the plan locally. 2000 – Assembly Speaker Robert Hertzberg launched SCOR23 (Speaker’s Commission on Regionalism) to promote regionalism and collaboration across California. Sunne McPeak representing the Bay Area Council, and many of the BAASC, NGOs and stakeholders, were part of this new group. 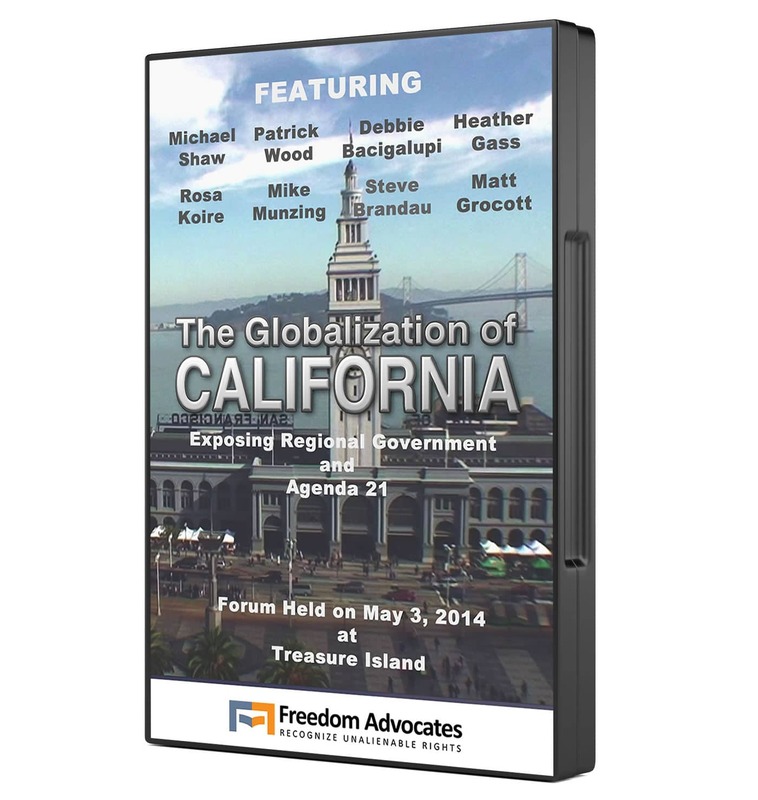 Its main purpose was to push for legislation institutionalizing regionalism throughout California. Sunne McPeak was also the ABAG President. 2001 – First Round of stakeholder workshops (approximately 1000 participants) from all 9 Bay Area counties. These meetings were mostly attended by ABAG and MTC officials, planners, developers and social / environmental justice advocates who were stakeholders in the BAASC. 2002 – Second Round of stakeholder workshops (approx. 1000 participants). Three Regional Scenarios are proposed (Central Cities, Network of Neighborhoods and Smarter Suburbs). The preferred scenario was Network of Neighborhoods. ABAG develops policy-based projections using the Smart Growth Scenario as a starting point. – Publication of “Shaping Our Future” was the result of this coalition. 2003 – ABAG Executive Board adopts policy-based projections abandoning the trends-based projection model used in the past. This approach forces development to occur based on the preferred land use and transportation scenario. MTC’s RTP (Regional Transportation Plan) is based on ABAG’s projections. 2005 – Governor Schwarzenegger passes Executive Order S-3-0524 to reduce GHGs in California to 80% below 1990 levels by the year 2050. 2006 – AB32 legislation passed – calls for a reduction in GHGs to 1990 levels by 2020. CARB (California Air Resources Board) is appointed to oversee and monitor state level GHGs. – SB375 legislation introduced (Assemblyman Mark DeSaulnier was one of the co-authors of SB375 with Assemblyman Darrell Steinberg). Mark DeSaulnier served on the following boards ABAG, MTC, CARB and BAAQMD (Bay Area Air Quality Management District) all proponents of this legislation. 2008 – SB375 legislation passed – Links land use to transportation. Directs regional agencies to create blueprints focusing development in PDAs (Priority Development Areas) next to mass transit for the purpose of reducing GHGs based on AB32 legislation. 2010 – AB2785 legislation passed – California Wildlands Act. The California Essential Habitat Connectivity report sponsored by DOT (Dept of Transportation), CalTrans and DFG (Dept of Fish and Game) shows many maps of the intended wildlife corridor system throughout California. This document is quietly being used by all planning, transportation agencies and commissions throughout California without the public’s knowledge. As you can see, the One Bay Area Plan did not originate as an organic bottom-up plan, nor did it start with state-level legislation. The President’s Council on Sustainable Development brought the idea to the regional agencies. The regional agencies then joined forces with local NGOs, stakeholders and foundations. The plan to socially re-engineer the Bay Area was going on long before the legislation (SB375, AB32 and AB2785) came to pass. This first-ever regional plan in the Bay Area is scheduled to be adopted by the JPC (Joint Policy Committee) of MTC and ABAG in June of 2013 and if and when it does, local jurisdictions will become virtually irrelevant. When money and power are concentrated at higher and higher levels by unelected regional boards, bodies, and commissions, the end result is uncontrolled power and corruption. Someday the citizens of the Bay Area and throughout California will wonder what happened to their beautiful unique towns and suburbs and go looking for answers. I’m hoping my research will give them the answers they seek and help them hold those behind this plan accountable. No one knows how this will end…. 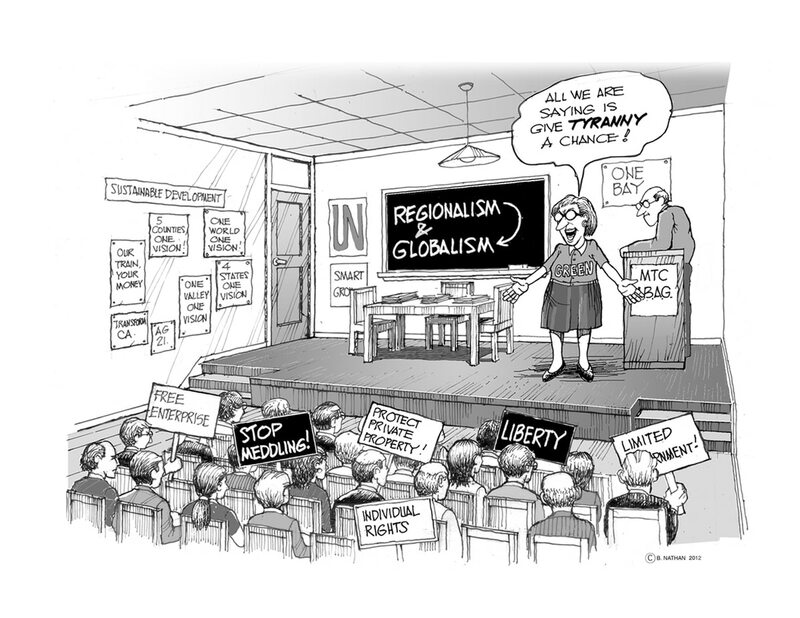 But regionalism is taking over and the result is loss of local control for the people. This is not about right and left anymore. This is about right and wrong. 14. 1992 CSPAN video HConRes 353: Agenda21 bill authored by Nancy Pelosi http://www.youtube.com/watch?v=XUBwIJWH7ew&feature=player_embedded#!